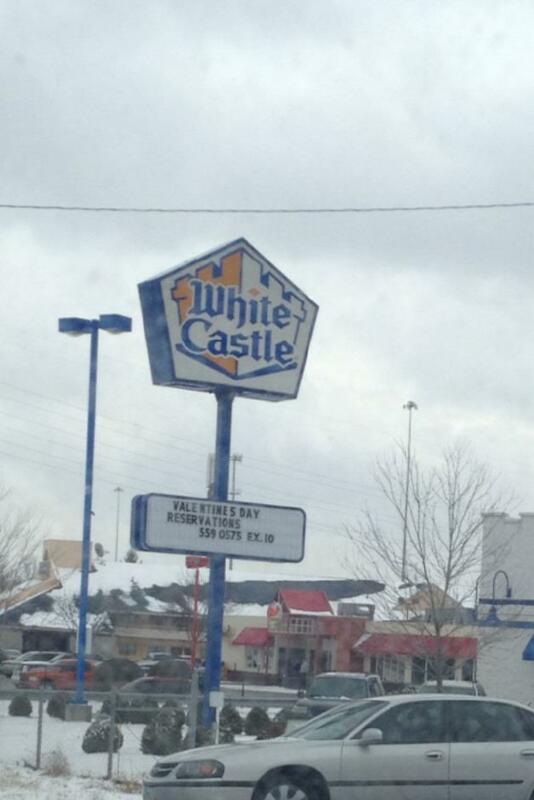 A White Castle with an ad for Valentine’s Day reservations, for that special guy who doesn’t want to get laid on the 14th. I’m thinking that just forgetting Valentine’s Day entirely is probably preferable to making reservations for a special evening at White Castle. Nothing says “love” like a plate of tiny burgers composed of 90% slime. This entry was posted on Saturday, February 2nd, 2013 at 9:06 pm	and is filed under Musings. The entry is tagged under You can follow any responses to this entry through the RSS 2.0 feed. You can skip to the end and leave a response. Pinging is currently not allowed.